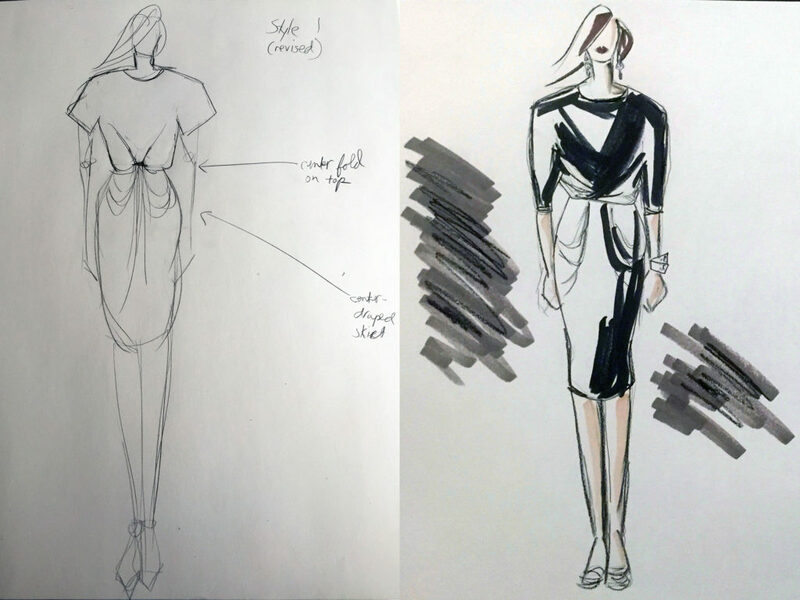 Some designs are well suited to be translated easily from flat sketch to pattern (with measurement specs of course). However other designs that require draping, or functional items that need to be experiemented with can benefit from having a LIVE Collaborative Design Session. What does that mean? It’s a "workshop" style meeting where I, as your pattern maker, and you, as the designer, can work together and collaborate on what works or doesn’t work, how your ideas affects the product or garment design and discuss potential production challenges. We can make changes to the prototype, utilizing the sewing machines (and the seam ripper) right here in the studio, and accomplish more in a 3-4 hour session than might be accomplished in 2-3 weeks with back and forth notes, fittings, and of course time in between meetings. This is an opportunity for you to utilize an “in house” pattern maker, without of course hiring your own team. I have worked with a few clients in this manner over the years, including Bryn Taylor during the development of her launch collection for Ouisa. I asked her to share her experience working together. 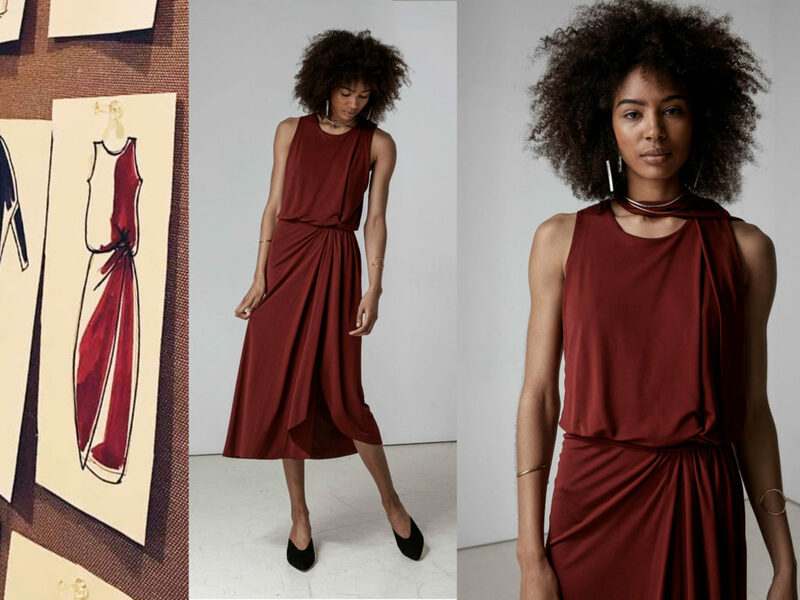 She was very prepared as a designer and was able to communicate her vision, but was also very open to collaborating and making changes to her designs as the line evolved, and going along with what the fabric "wanted". How do you prepare, and what do you need to bring to have a productive Design Session? Design is visual, so as expected, the more visual information you can provide to convey your vision, the better I can understand what you want to achieve. How did working together live with your pattern maker streamline your development process or help improve your end product? Sometimes when you design something, especially with draping, you may need to change fabrics or change the design in order to make something work. 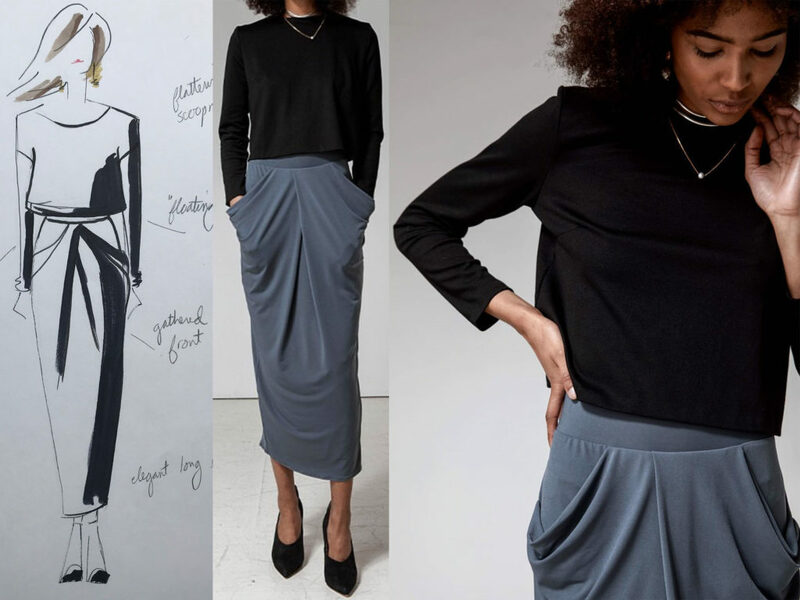 What you drew on your sketch may look a lot different once it’s in fabric on a mannequin or model. This is one reason it’s important to use your real fabric (or very close substitute) when prototyping. The design evolves and is edited with each prototype, and sometimes multiple times in a Design Session. What types of designs are best to work on during a Collaborative Design Session? I don’t think this session is necessary for all designs, and I wouldn’t encourage someone to schedule this type of session for their entire collection even, unless each was a very complex draped piece. It doesn’t serve both parties well to have you sit around while the pattern is cut out or prepared for the session. Sometimes there are elements of a garment that can be placed and added on during a fitting, such as a patch pocket placement on pants, or leaving a strap unfinished to get the correct length and placement. 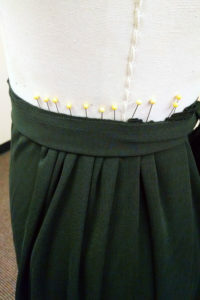 That means the full garment is otherwise finished, with just very small elements being placed and sewn live. With a draped design or a conceptual prototype, we may be testing multiple design elements to see what works, what doesn’t. Conceptual prototypes are usually for highly functional garments, for sports performance, medical or other application, and often are products that may be eligible for a patent. It can also be helpful in the later stages of finalizing your prototype (meaning this is the 3rd or 4th or later version), and only small tweaks are needed at this point. Rather than making a new prototype or waiting to make those minor adjustments, we can do that together and refit on your fit model immediately to confirm and approve the final prototype. This is largely dependent on what that change is, but something like a hem length, adjusting a waistband, rotating pockets, or taking in a hip, can all be easily done live. Thank you Bryn for sharing your experience and some photos from the development process! Photos provided by Bryn Taylor.